We are one of the few Massage Establishments (Texas Department of State Health Services license 2512) in the Houston area to offer Myofascial Release Therapy as developed by John Barnes. Barnes has developed some amazing techniques that have proven to be very effective in a wide variety of medical conditions. Fascia, pictured above, (sometimes called dense fibrous connective tissue) is a 3 dimensional web of connective tissue that penetrates all areas of the body. It is very important to the body. It surrounds muscles, groups of muscle, blood vessels and nerves. It binds some structures together, but allows others to glide smoothly over each other. It suspends organs in their proper locations. It has been speculated that if there was some magical way to dissolve all parts of the body except for the fascia, the resulting structure would still be recognizably human. If you are interested in visually exploring what fascia looks like in a living human, there is a series of medical DVDs produced by a French Plastic surgeon, Dr. Jean-Claude Giumerteau, that are available on the Internet with brief clips available on YouTube. Adhesions can sometimes form in Fascia. When this happens the ideal smooth gliding of the fascial sheets cannot occur. The adhesions can be the results of impact injuries, scaring caused by surgery, or even habitually poor posture. Since fascia has approximately the same strength as the cord of a radial tire, it can exert tremendous pressure on the pain receptors of the body and also limit range of motion. With this much strength, it cannot be forced by deep pressure massage no matter how hard the therapist presses. However, fascia will yield to sustained, continuous pressure. John Barnes has developed a very gentle style of therapy that applies gentle pressure to specific locations on the body for 3 to 5 minutes to induce a very slow "melting" of the fascia. 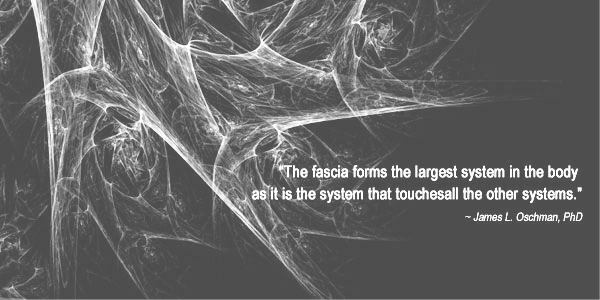 To the therapist, the slow release of the fascia feels like taffy pulling with a slow increase in elasticity. The very light pressure used in the massage means that it is unusual for the client to feel any discomfort during the massage. However, sometimes a client might feel some soreness or stiffness where range of motion has been restored to previously immobile tissue. The locking of the fascia might have impeded blood flow to an area which allowed waste products or toxins to accumulate in the tissue. For this reason, we often conclude MFR therapy with a little traditional Swedish Relaxation massage. The long gliding strokes of Swedish massage are very effective in increasing circulation in a region and in flushing away waste products. The John Barnes style of Myofascial Release is normally done with the client undraped and wearing a swim suit since the therapist needs to observe the client's body response to the therapy. Often when fascia restrictions are released in one part of the body, a flushing or redness will occur somewhere else on the body. This color change is a signal to the therapist to direct attention to this new area. John Barnes style of MFR is really designed for chronic conditions. It's worth trying if other styles of massage therapy have not corrected a condition. More specifically, if deep tissue massage has not helped a chronic condition such as a sore back or sore neck, the issue may not involve the muscles but instead involve the fascia. Fibromyalgia is a medical condition that can only be diagnosed by a physician and for which there is no cure. However, there is no test or medical equipment that can conclusively determine whether or not an individual has fibromyalgia. For this reason, some physicians have speculated that fibromyalgia is a mental condition not a physical condition. However, whatever the cause, the pain from fibromyalgia is very real. Fibromyalgia is normally diagnosed when all other possible causes for the symptoms have been eliminated. 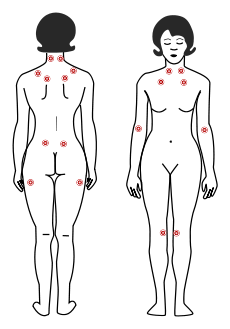 One indication of fibromyalgia is when pain or tenderness is associated with 9 pairs of specific points on the body. Within the MFR community, it has been speculated that fibromyalgia may be caused by the fascia putting pressure on local pain receptors. In some cases, MFR therapy has provided short term relief from the pain of fibromyalgia. How long the relief lasts varies greatly with the individual. While we do offer reduced costs packages for multiple therapy sessions packages for fibromyalgia, we recommend that the client first experience one MFR treatment to evaluate its effectiveness for their specific condition, before committing to multiple session packages.